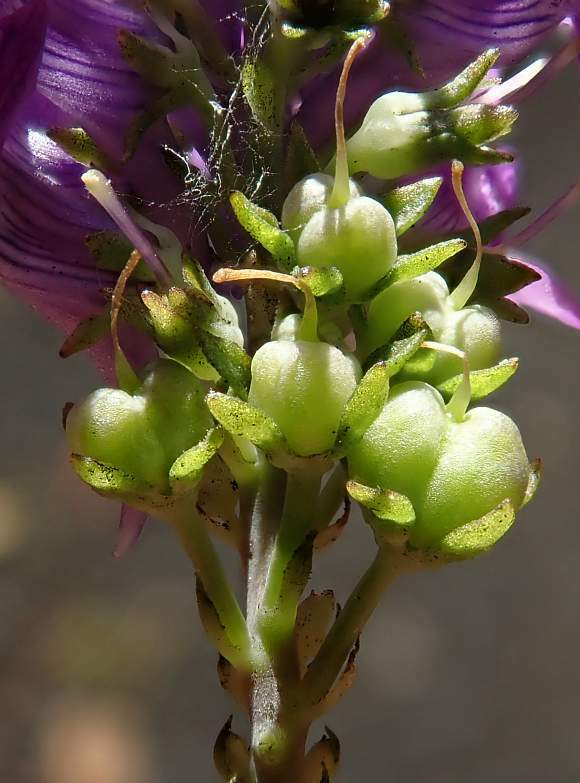 Grows about 3 or 4 feet tall as a mass of upright shoots with a purple spike of flowers atop. 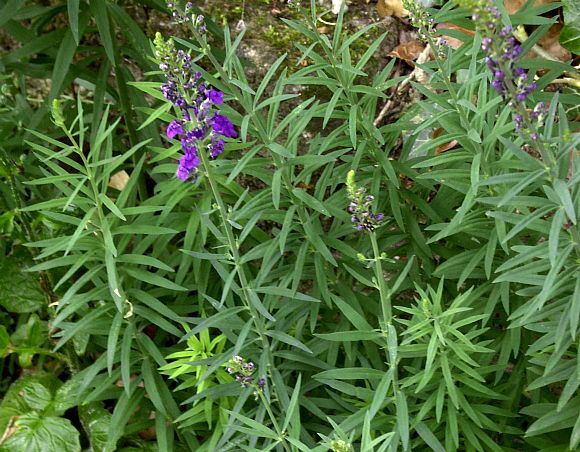 Possesses some similarities to Purple Loosestrife. The long narrow linear leaves on all sides of the stem all the way up the stem. 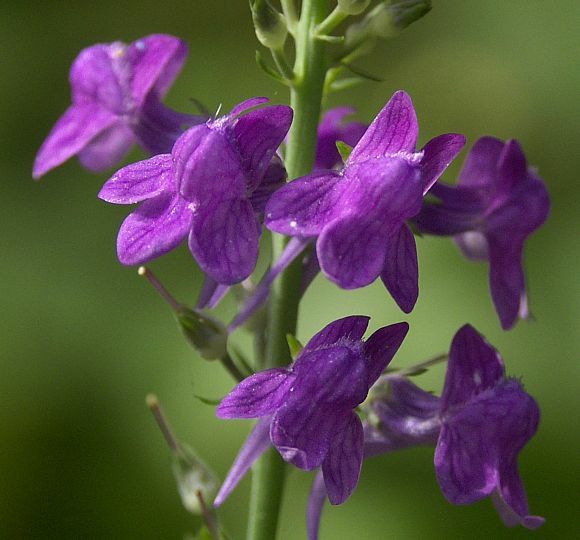 The flowers are bright violet or a paler violet with purple veins. those at the top have not yet opened whilst those at the bottom have already flowered and are turning to fruit, replete with long style still attached. 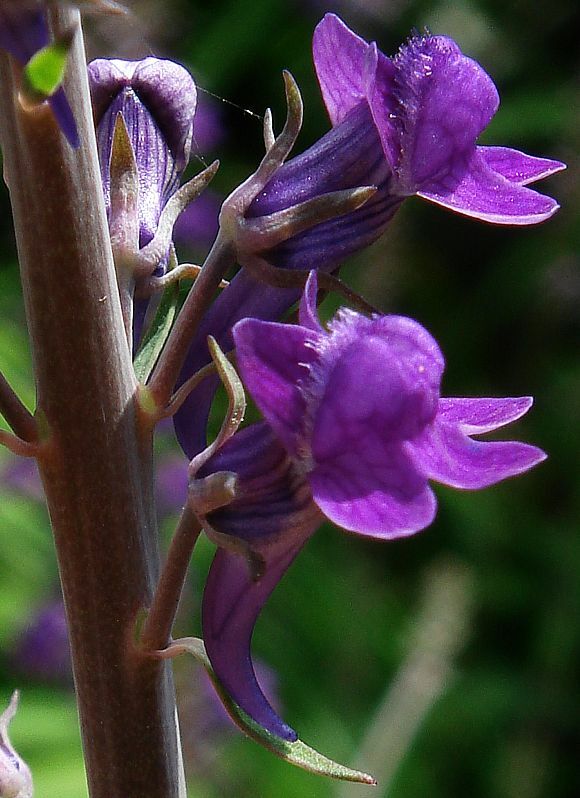 The flowers have a spur at the rear that hangs downwards and is not obvious at first glance. Viewed from the back the flowers have very long and obvious spurs. 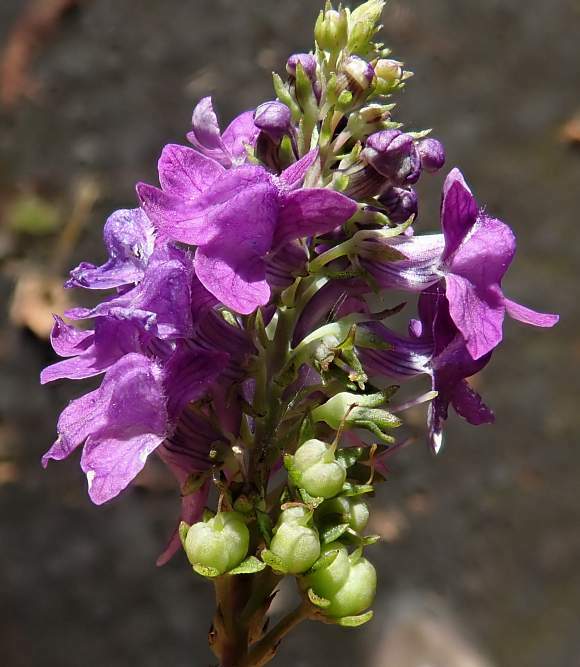 The flowers are typical snap-dragon patter: two ears sticking up, two bulbous middles, and three lobes pointing downwards and partly sideways, besides the rear spur. 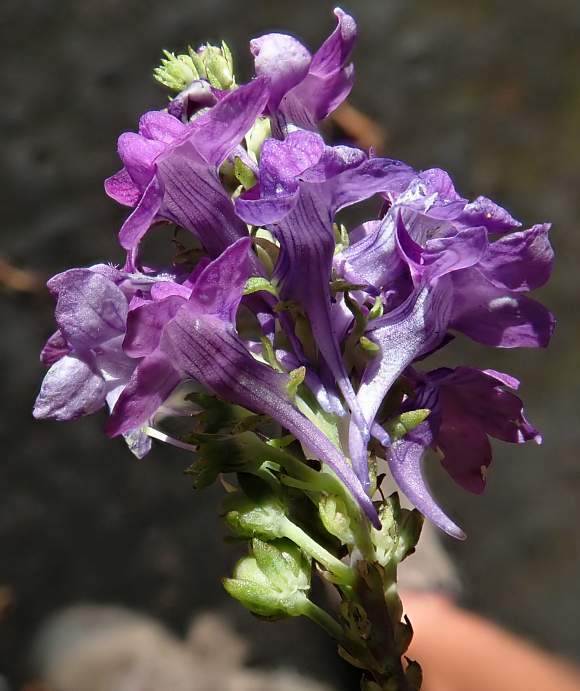 The sepals, of which there are 5, were once green but now browned and are long and thin. There is a single long ligule just below each flower stalk as it emerges from the main stem. The fruits at the bottom are now at a more advanced stage, with the ovary now much more swollen, but still with (withering) style attached. 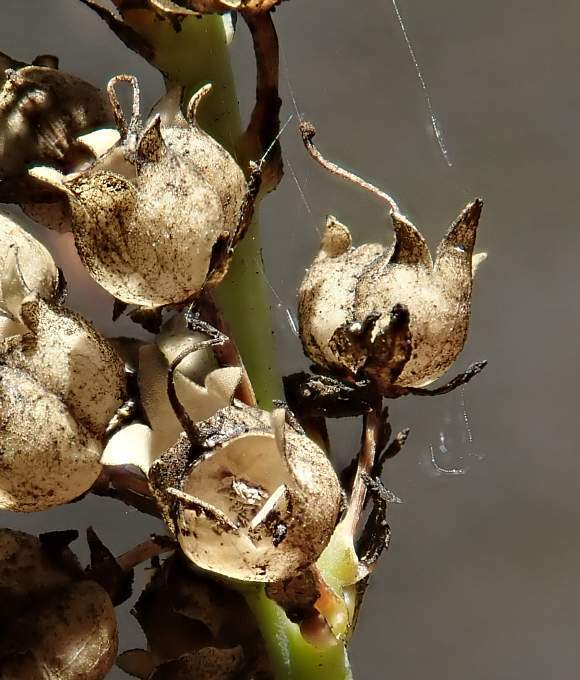 The fruits are 'double-barrelled' and still surrounded by sepal teeth, but which are now much more obvious than they were with the flowers in their stead. The sepal teeth are still beneath the now opened and empty fruit cases; the seeds having dispersed. That these are the dried outer casings of the double-barrelled fruit can be deduced from the presence of the (now dried and shrivelled) style which is still attached on the top of what now appears as a curved bridge across the double-opening (see lowest fruit-case). This bridge was once where the two fruits were fused; the style is still attached in its centre. The two halves split open independently; the three recurved teeth on each side bear testament to that. The leaves on a young shoot look like they are in whorls. No relation to : Flaxes such as Cultivated Flax (Linum usitatissimum) [plants with similar names belonging to differing families]. 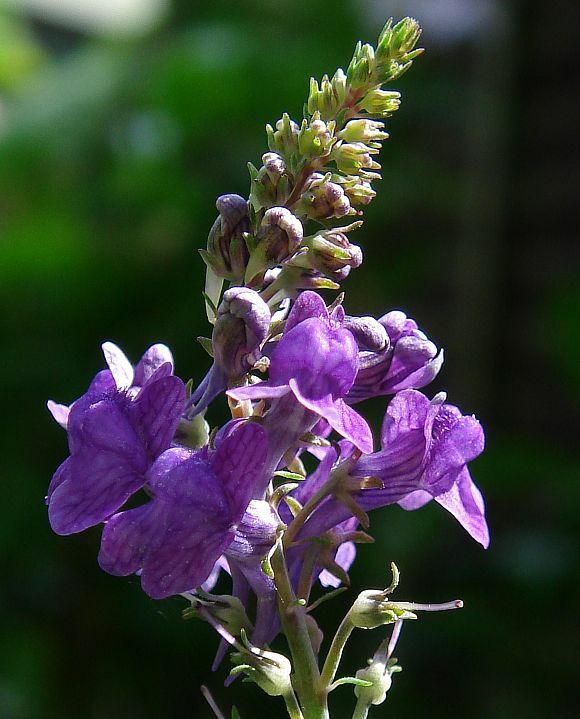 Hybridizes with : Pale Toadflax (Linaria repens) to produce Linaria × dominii . 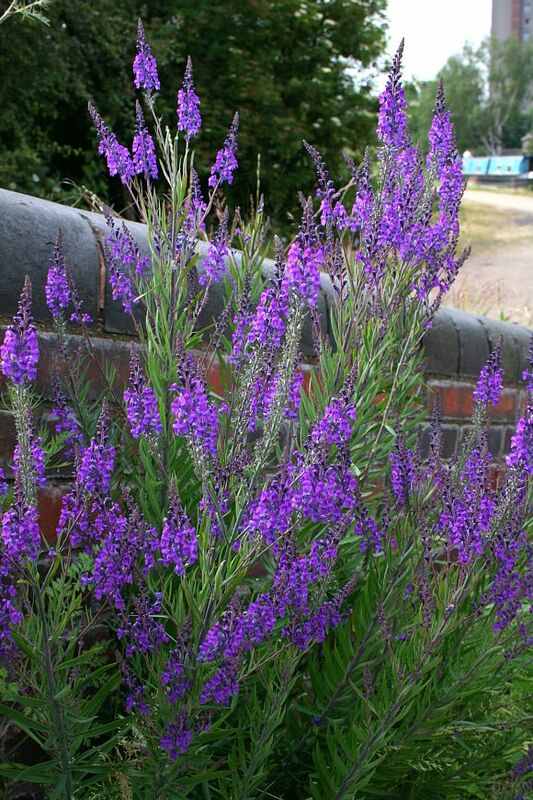 Not to be confused with: Purple Loosestrife which looks vaguely similar.